The UF/IFAS Extension and FAMU will be bringing the Florida Pest Management Conference to Milton on April 17th. 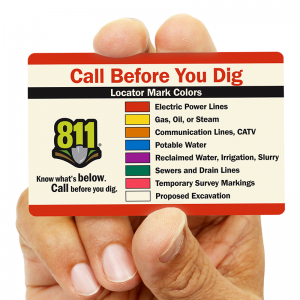 Attend to earn CEUs for your PCO License. Attendance is free and we are currently seeking sponsors at $80 per sponsoring business/organization. For more details and to register, please visit the conference webpage at Northwest Pest Management Conference. 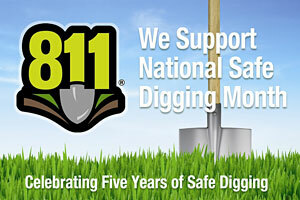 With spring on the horizon, many of us are planning or have already began to plant our spring gardens. If you’re still in the planning process like me, one very important thing to consider is the importance of crop rotation in the garden. Crop rotation is a concept that’s been used by farmers for many years but it’s a concept that gardeners need to adopt as well! 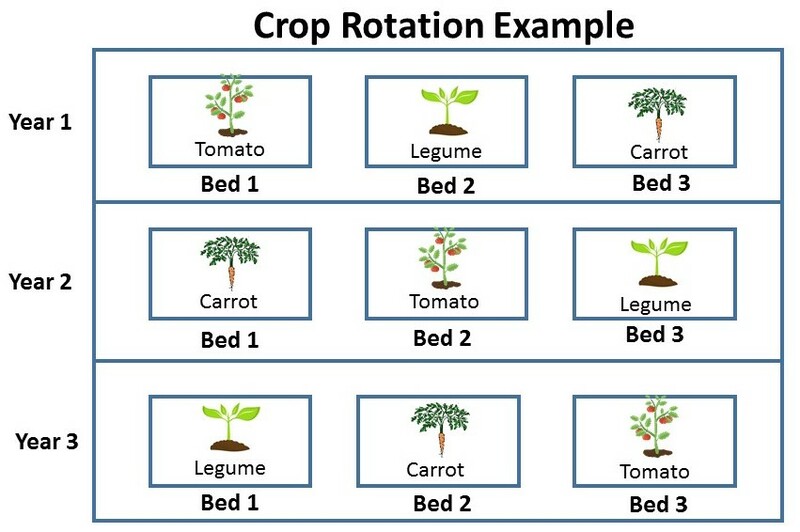 Crop rotation is a method used to reduce insect pests, disease and manage soil fertility by changing the planting location of vegetables within the garden each season. Each vegetable is grouped into a plant family. Vegetables in the same plant family typically are able to harbor the same kinds of insect pests and diseases, and have the similar nutrient requirements. 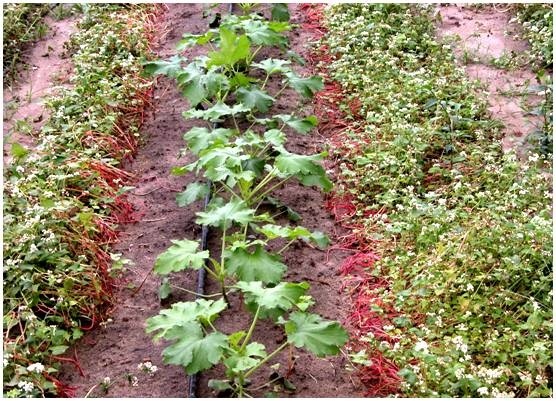 When vegetables belonging to the same plant family are planted in the same location over and over again, pest populations can build up and productivity of the garden decreases. In addition, fertility issues can arise from planting the same crops, in the same area over again. Since different crops require different types and amounts of nutrients, crop rotation can help even out the loss of soil nutrients. 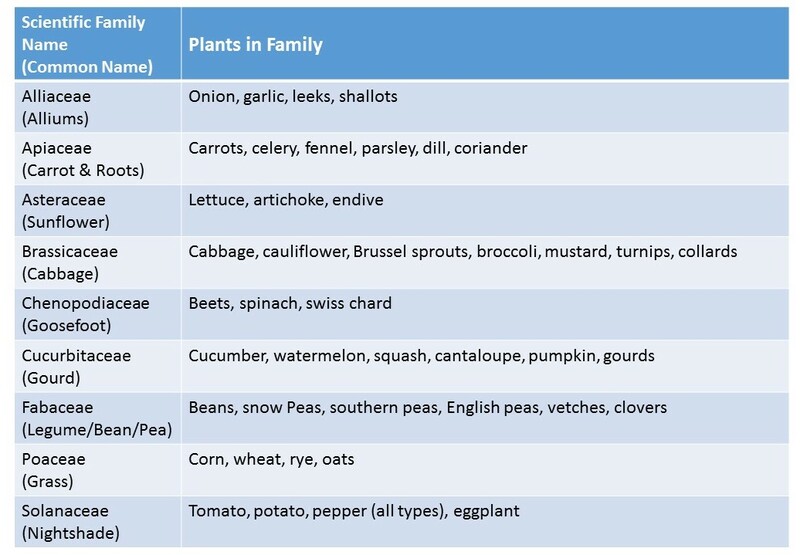 List of common vegetable families. 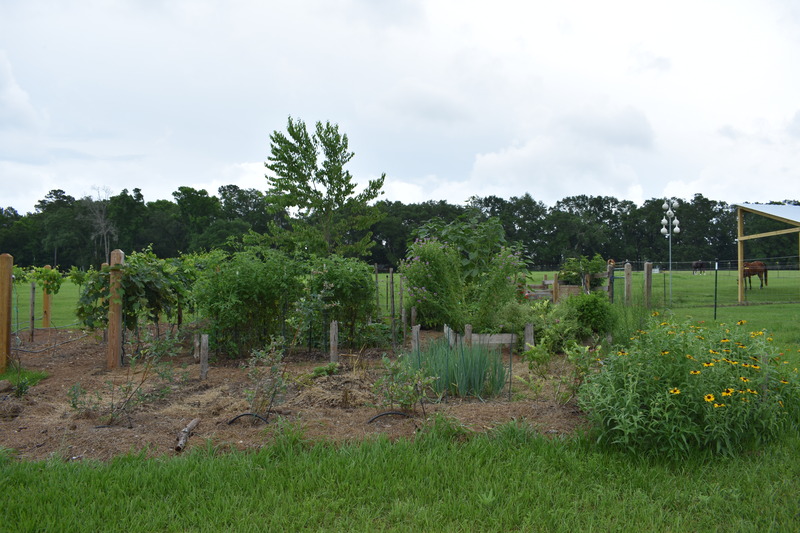 How should I plan for crop rotation in my garden? First, consider the vegetables you would like to grow this season then group them by their families. 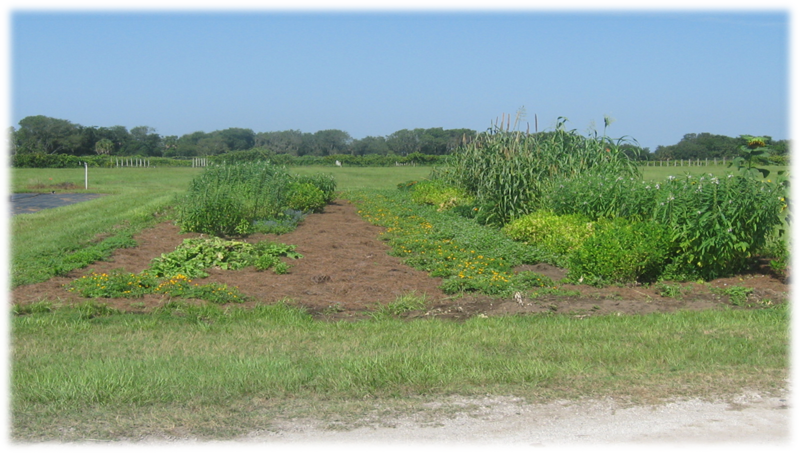 Vegetable crops in the same family should NOT be planted in the same area year after year. For example, if squash is planted in a bed or one area of the garden one year, cucumbers or watermelons should not be planted in the same area of the garden the following year because these plants belong to the same family (Cucurbitaceae). Divide your garden according to the number of plant families you want to grow. This could be in rows or even separate beds. 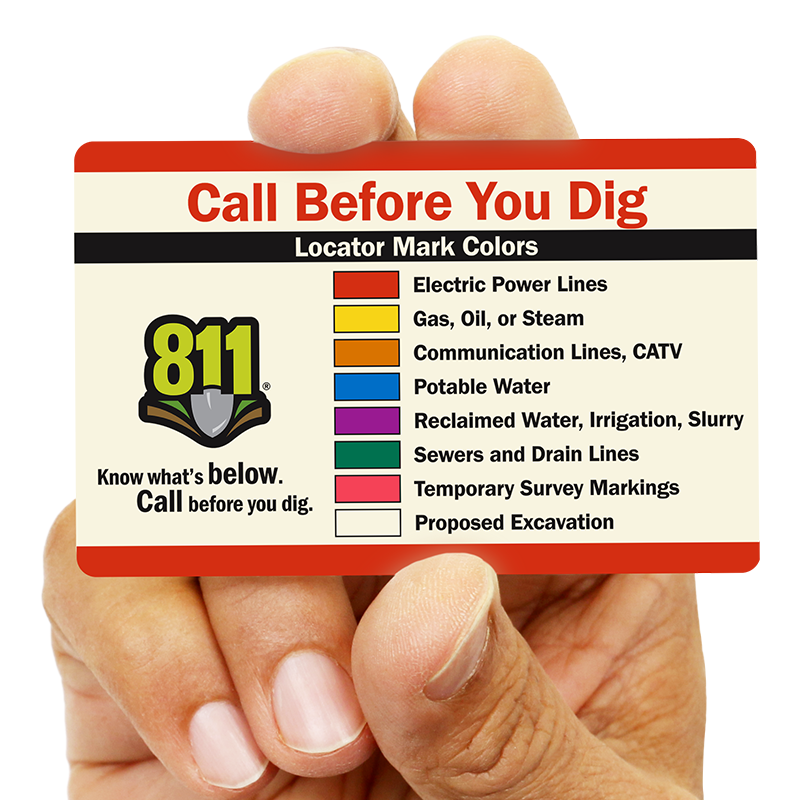 From there, you will want to think about your ordering sequence. 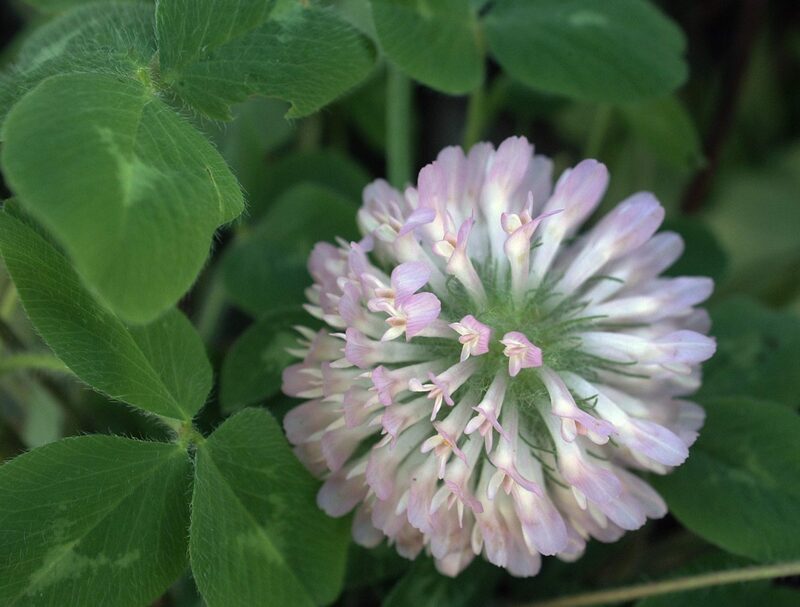 For example, if you are planting a legume (beans or peas) that fixes nitrogen back into the soil this spring, you’ll want to plant a heavy feeding crop like broccoli this fall. Heavy feeding crops can be followed by light feeding crops such as carrots or onions. Be sure to keep a gardening journal as a reminder of what is planted each year and season. 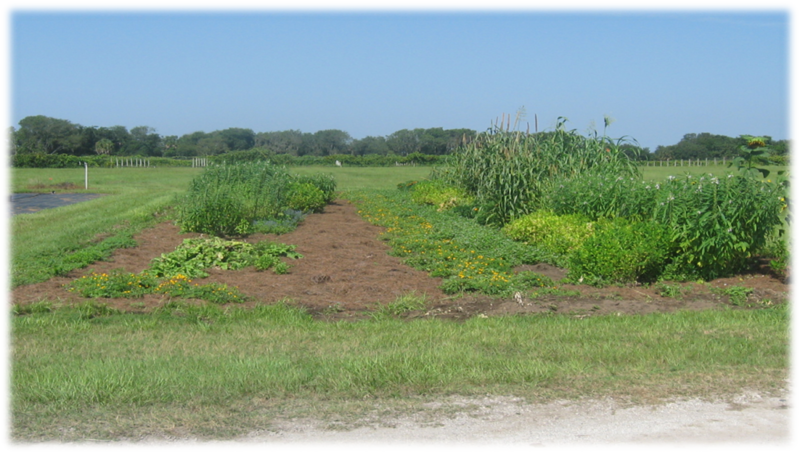 Crop rotation is one of the most effective methods we have to manage the many pests and diseases we have here in Florida. If you’re struggling with a particular pest or disease in your garden, consider using crop rotation to help manage it. For more information on crop rotations for the home garden, contact your local extension agent. Why would anyone allow dozens of wasps to thrive in their garden? Why would they let caterpillars keep moving through their pepper bushes? Don’t they know you can spray for that? 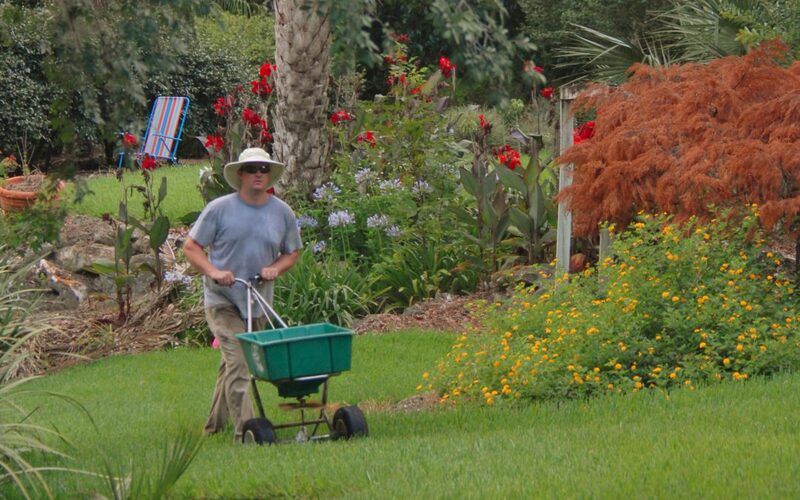 As Extension agents, one of the tenets we “preach” in gardening is the concept of Integrated Pest Management (IPM). This technique involves a series of insect control measures that begin with the “least toxic” method of control, using chemicals as a last resort. 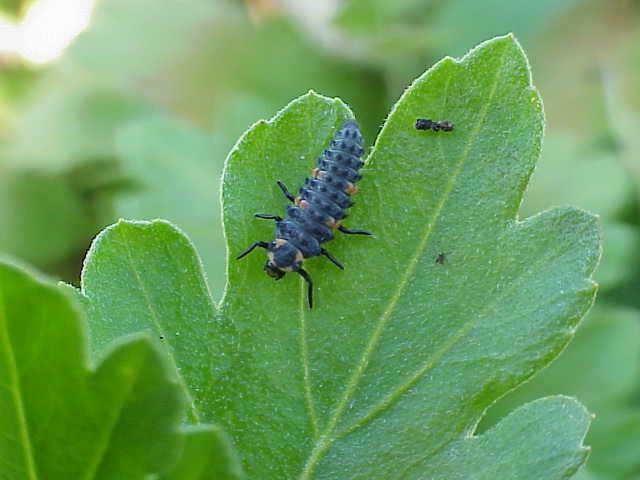 One of those least toxic measures is “biological control”, in which a natural predator or parasite is recognized and allowed to remove a pest insect naturally. It is important to be able to recognize some of the more common garden predators and parasites. Many times these insects look strange or dangerous, and they are mistaken for pests and killed. One such beneficial insect to the home gardener is the braconid wasp (Cotesia congregatus). Most people shudder at the mention of wasps, but these tiny (1/8 inch long), mostly transparent wasps are of no danger to humans. Quite the opposite–they are an excellent addition to gardens, especially if you are growing tomatoes or peppers. 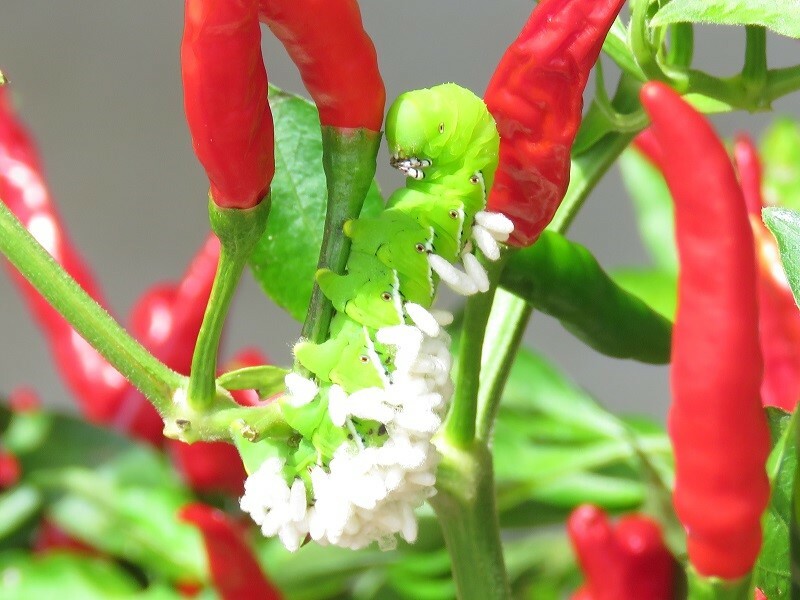 One of the major pests to these favorite vegetables is the tomato hornworm (Manduca quinquemaculata), a fat green and white-striped caterpillar. 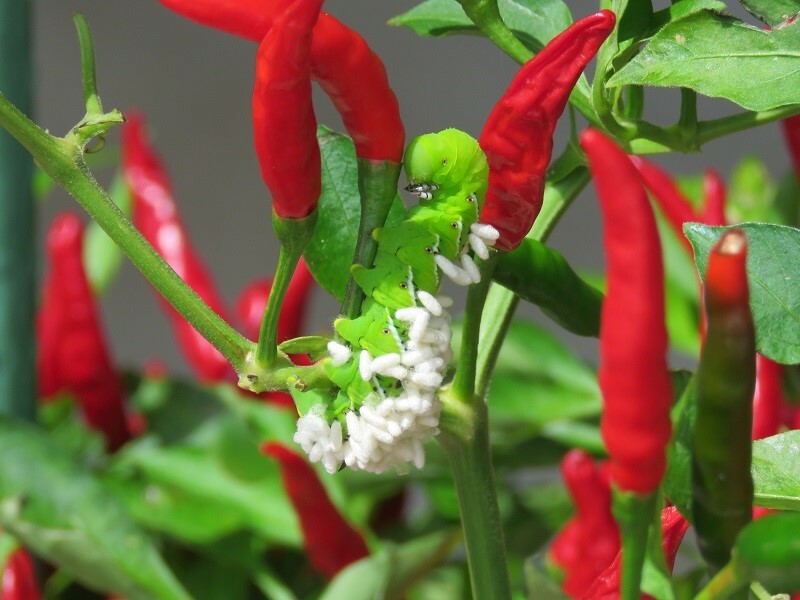 The beneficial wasp can control hornworms because females lay eggs under the caterpillar’s skin, after which the eggs hatch and larvae feed on the hornworm. After eating through the caterpillar, they form dozens of tiny white cocoons on the caterpillar’s skin. The tomato hornworm is rendered weak and near death, and the vegetable crop is saved. If you happen to find a tomato hornworm covered in these small oval cocoons, consider yourself lucky. Let the process continue, allowing the new generation of beneficial wasps to hatch and continue their life cycle. They will control any future hornworms in your garden, and the whole process is fascinating to watch! For questions on integrated pest management, beneficial insects, or growing peppers and tomatoes, call your local County Extension office.